A ten gallon tank works best, although some use 5 gallons and even 20 gallons with success. Optimally, the tank should not be so small that the female can't escape, and not so large that the pair keep losing each other. I've found that a ten gallon tank filled halfway works the best. Hiding places are provided for the female in the form of rocks, caves, PVC pipes, pots, and live or artificial plants. Live plants are recommended, as they don't tear the fins of the male like plastic plants can, and they provide infusoria for the new fry. The tank should be bare-bottomed, so a floating plant like Water Sprite is excellent. The reason for the tank being bare is that it is harder to siphon all the waste through gravel, and it will be harder for the male to see and retrieve eggs and/or fry. Fry also can (and do!) get stuck down there in the gravel and die. A seasoned sponge filter or small corner box filter can be added, but don't turn it on quite yet. The movement will scatter eggs and make nest tending difficult for the male. If the water in the room drops below 75 degrees or so, a heater should be used. Bettas in good health will usually spawn in water that is the same temperature they are used to, or with some slight rise in temperature, but the higher temps produce the greatest spawning success rate and thriving fry. So you will usually have to use a heater, and since the water level is only at 5 inches or so, you'll need the submersible kind. Turn it on and wait for it to level out at about 82 degrees, adjusting as necessary. Do not add the pair until the temperature has leveled! Your last touch is to give the male something to build his nest under. A plastic lid, a styrofoam cup cut in half lengthwise, or an indian almond leaf serve this purpose well. Float the object in the tank where it will give you a good view. You'll want to be able to monitor the nest later to make sure the male isn't eating eggs or fry, and that the fry are developing properly. Be warned, though, that many males do not appreciate being the center of attention when they are nesting, and will sometimes ignore the nest site you've picked out for them and go build a nest in the back corner of the tank. Now you can introduce the pair. The usual method is to give the female some sort of protection from the male while still allowing her to be seen by him, and this is provided by placing her in a glass chimney (opened-topped, of course), floating her in a jar, or putting her on one side of a divider and him on another. The male is given the run of the tank, and he will usually poke around in the corners, nose under the lid, and patrol his perimeters before he even starts nest-building. Once the pair discovers one another, the excitement begins. 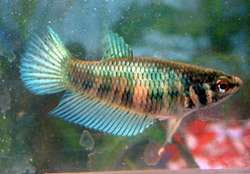 The male turns a deeper color and immediately presents the female with a side view of his fully-flared fins and open gills. He will soar by a couple of times to make sure she is adequately impressed, and then may start to wag his body at her. If she's receptive, her color will darken and she will display her 'barring' pattern - vertical stripes along her midsection that indicates her breeding readiness. Her ovipostor will be clearly visible as a speck of white (looks like a large granule of pretzel salt) between her ventral fins. If she's cheeky, she'll flare back at him and wag her body flirtatiously. Some girls are just shy and will clamp their fins in submission or try to ignore the male. As long as they have the barring pattern and not the horizontal stripes, they should still be okay. When the female displays her bars, this is usually the impetus for the male to begin nest-building. He'll alternate his time blowing bubbles in his chosen nest site and blustering at the female. At this point many breeders release the female. Once released, she will often swim right up and begin checking out the nest. If its not to her specifications, she will swim away or sometimes try to destroy it. When the male discovers he can reach the female, his display will become even more impressive, as he chases her around the tank and tries to engage her in the mating dance. When the pair do start dancing, the breeder is treated to a real visual delight, as both fish spread fins and swim side-by-side, stopping every few inches to flare their gills at one another and display their sides. If he doesn't feel she is suitably awestruck by his performance, the male will nip the female and chase her around for a bit before dancing for her again. At this point the female usually seeks a place to hide until she is ready to spawn, and there she will stay until the male discovers her and chases her out, or until she's inclined to approach the male under the nest. Females initiate spawning in a multitude of different ways, according to the circumstances and the personalities of the fish. Some females swim right up with their heads down and fins clamped to show their submissiveness, others will boldly charge the nest, banners flaring, and basically challenge the male to spawn. Sometimes she will dart away again or the male will bite her and chase her away because he doesn't like her attitude. At any rate, spawning begins with the pair nosing into each other's sides until the male is able to flip the female upside down and wrap himself around her midsection. This may take several tries, especially for first-timers, but the male will eventually succeed in performing a successful embrace. You know he's doing it right when you see his body 'click' into place around her. The embracing pair will either float at the surface or sink to the bottom, and then the male releases her and waits for her to recover. The female will float sideways for a time, and will look for all the world like she is dead. When she does recover, she will usually check the bottom for fallen eggs before joining the male for another embrace. The first few embraces are usually eggless, but eventually the male will succeed in squeezing some eggs out, and he will fertilize them as they emerge. When the male notices the eggs falling, he will gather them in his mouth and place them in the bubblenest. Females usually assist with egg-gathering, but seem more inclined to eat them than the males do. Females are typically meticulous about finding each and every egg that may have dropped to the bottom, whereas males are satisfied just catching the ones that are falling. Spawning takes from 2 to 6 hours, and when either partner decides to terminate the spawn, the female will retreat from the nest and go back into hiding. Now the male sees her as a threat to his clutch rather than a mate, and he will try to kill her if he sees her, so it is best to remove her and put her into some medicated water for her fins. The male will tend the nest, mouthing the eggs, blowing more bubbles, building a nest in another location and moving the eggs there, catching them when they fall, and eating eggs that are infertile so that they don't fungus and kill the rest of the eggs. Most of his time is spent just hovering under the nest looking bored, periodically checking to see if the eggs have hatched yet. 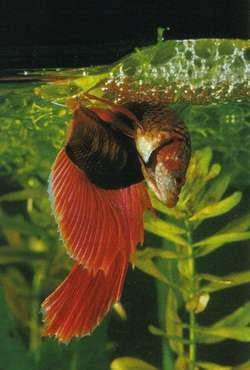 Some males, especially first-timers, will eat the eggs or fry, leaving the breeder frustrated. Most of them outgrow egg-eating as they gain experience with spawning, but some males will always be egg-eaters, and are best retired. Alternately, the breeder can choose to remove the male after spawning and raise the clutch without him (see 'Raising the Fry'). As the fry hatch, their wriggling efforts will often shake them loose from the bubbles and they will start to fall. If he's sees them, their father will catch them and put them back. When they are all hatching at the same time, he is kept very busy darting around catching and replacing fry, and scanning the bottom for any he may have missed. In another day, the fry will be better able to stay in the nest. They will hang tail-down from the nest for their first couple of days, gradually taking on a horizontal swimming position. Once they are free-swimming, the male can be removed and the fry given their first feeding of infusoria, microworms, vinegar eels, or any of the other food options available to breeders of egg-layers.